Titanite slab for weapon reinforcement, said to once belong to the gods. Reinforces weapons to their highest level. 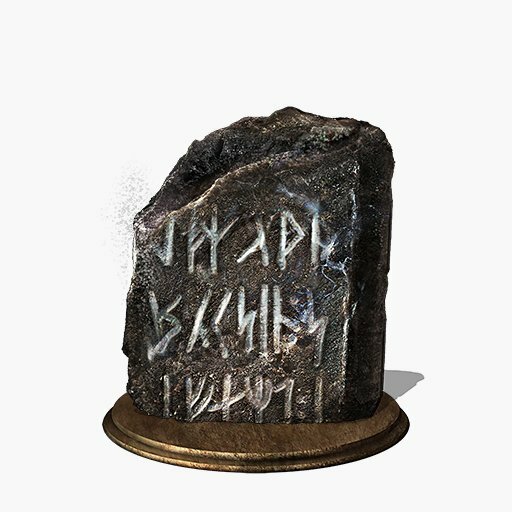 Titanite slabs are smithing materials of the gods, and weapons reinforced with slabs will be admired no less than their precious legendary weapons. Used to reinforce any weapon to its highest level. In Dark Souls III, even non-titanite-enforced weapons require a slab to fully max out its upgrades. Irithyll Dungeon: Reward for freeing Siegward of Catarina from his cell. Grand Archives: Received upon defeating the trio of Golden Winged Knights on the rooftop. Only once per playthrough. Archdragon Peak: Found on a corpse next to Havel the Rock, who is found on the route between the Dragon-Kin Mausoleum bonfire and the Great Belfry bonfire. Archdragon Peak: Found on a corpse in the area after The Nameless King. Can be obtained from Pickle Pee in return of an Coiled Sword Fragment (only once per NG). Painted World of Ariandel: One found by killing the animated trees and climbing the huge ladder near the Depths of the Painting bonfire. Painted World of Ariandel: One received after the second phase of the Sister Friede fight. Painted World of Ariandel: One given by the friendly Corvian after killing Sister Friede. The Dreg Heap: One is found in the cave by the swamp area in the Dreg Heap from the Earthen Peak Ruins bonfire. If you don't get it yourself, Lapp will get it for you if you exhaust all his dialogue up to that point. The Ringed City: One is received after the defeat of Halflight, Spear of the Church. The Ringed City: Given by Shira, Knight of Filianore after defeating Darkeater Midir. She will also drop it after killing her as an invader in the boss arena where the fight with Slave Knight Gael takes place. Hug the right wall after exiting the structure with the bonfire until you find a path down into some ruins, where Shira will invade. The Ringed City: Dropped by a Ringed Knight in Slave Knight Gael's boss arena, found by hugging the left wall after leaving the structure with the Filianore's Rest bonfire.